When trying to decide who belongs on a list of the 10 greatest road cyclists of all time, the first thing to discuss is criteria. With cycling full of GC contenders, sprinters, climbers, domestiques and those who concentrate on the Classics, we hit our first roadblock: it's impossible to compare these cyclists when their skill sets are so blatantly different. To make things easier, we've put a lot of emphasis on how riders performed in the general classification at Grand Tours, with a smaller emphasis on other stage races and Classics. This, of course, requires some heartfelt apologies to Mark Cavendish and Mario Cipollini, who are undoubtedly great in their respective disciplines but lack the overall prowess to compete in road races with even the slightest elevation gain. In the end, some are better at pedaling than others. Below is a list of the most powerful legs to have ever pedaled up and down the toughest ascents in Europe, sprinted to the finish despite fiery pain in their thighs, and claimed victory in races designed to be impossible. These are the baddest brutes to have ever graced concrete on two wheels. Note: Some of these dudes totally doped. While such wrongdoing certainly merits a strike or two against them, we can also shrug our shoulders and say the playing field was level. We did consider doping allegations and admitted use of performance-enhancing drugs when compiling this list, but we doubt the USADA will grant us any sense of approval. The fifth of six men who have claimed GC victories at all three Grand Tours, Contador grabbed our imagination in the post-Lance cycling world. Stripping the reins from Levi Leipheimer on the then Discovery Channel Team, Contador was, at one point, the defending champion of all three Grand Tours. Like many on this list, he's endured an onslaught of doping allegations, which saw the World Cycling Federation strip Contador of two Grand Tour wins— but cycling fans will never forget his graceful side-to-side "dance" up the toughest climbs in Europe. Kelly's success in the Classics never translated to Grand Tour victories, but boy did this Irishman have a lot of success in the Classics. Kelly claimed 10 Classics victories, triumphed seven times in the illustrious Paris-Nice—a record no one will ever top—and won cycling's first World Cup. Despite his lack of yellow or pink jerseys, Kelly did win the general classification in the Vuelta and won the Tour de France's points classification four times. Arguably the greatest all-around cyclist of all time, anyone who faced this beast in the 1980s wouldn't argue otherwise. A three-time winner of the Giro and two-time winner of the Tour, one can only wonder how many more victories Bartali would have claimed if not for his rival and fellow countryman, Fausto Coppi, or the forced hiatus brought about by World War II. Nonetheless, Bartali succeeded despite such misfortune. 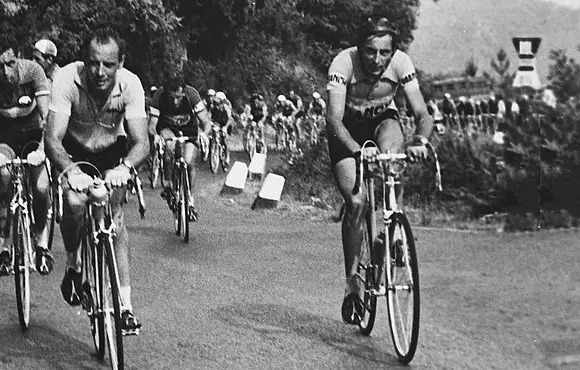 In addition to his Grand Tour success, Bartali won 24 Classics and four additional stage races. 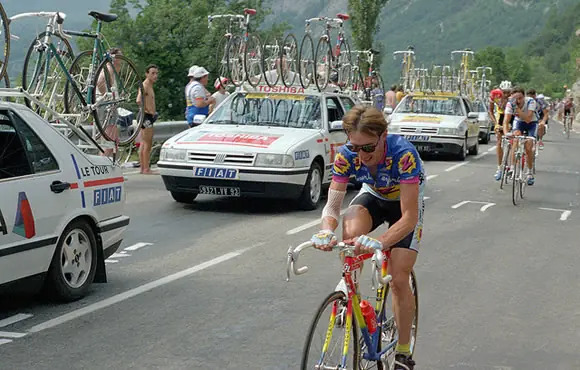 His two Tour de France victories came 10 years apart and, as one of the greatest climbers of all time, he won six consecutive mountains classifications at the Giro. Yes, we took into account the doping and the cheating and just generally being a jerk, but there was no way we were skipping Armstrong. He'd easily crack the top five, otherwise, but seven feels like a good spot for a man with seven straight Tour de France GC victories (ahem, feel free to strike that). You can claim he struggled in the other Grand Tour events, but that would ignore the fact that he never competed in the other events. Armstrong was all about the coveted yellow jersey, which he donned more than any other man in history. And he did, in fact, come back from near death to achieve ALL OF THIS. His battles with the great Jan Ullrich, the stare up Alpe d'Huez, and his comeback after his handlebar got caught in a knapsack all go down as some of the greatest cycling moments of all time. You can strip him of his titles, but we all remember what happened. Somehow, this five-time winner of the Giro d'Italia and three-time road world champion gets routinely overlooked by your typical "Greatest of" lists. But there's no mistaking the greatness of Alfredo Binda. After he refused to take political sides in the time of Italy's fascist regime, he lost any public support or recognition despite his dominance. Two other men, who appear later on this list, eventually matched Binda's five Giro GC victories. However, Binda rode during a time, the late 1920s, when the French and Italians rarely crossed country lines to participate in one another's races, and the Vuelta was virtually nonexistent. And the lone time Binda did compete in the Tour? He tallied two stage wins. Another man who faced doping allegations throughout his career, Indurain entered cycling during a time when performance enhancing drugs became commonplace among cyclists. Still, Indurain claimed five Tour de France GC titles and two Giro GC titles. Though he never won the Vuelta, he became the youngest rider to have led the mammoth race in Spain at the tender age of 20. His accolades also include the Olympic Time Trial Gold Medal in Atlanta and a victory at the World Time Trial Championship the year before. No matter the circumstance, Indurain dominated the sport of cycling for five years. We call that, in the wide world of sports, a dynasty. Like Dr. J was the first man to dunk from the free-throw line, Anquetil was the first to reach five GC victories at the Tour de France. His confidence—some might say cockiness—was a mix of Ali and Michael Jordan on the bike. He once famously predicted before the 1961 Tour de France that he would lead the 23-stage race from start to finish. And, like a Nostradamus of cycling, Anquetil followed up on his prediction. In addition to his Grand Tour success, Anquetil also won Paris-Nice five times and Bordeaux-Paris. Oh, and doping allegations plagued him throughout his entire career (shrug). But at the time, few cyclists could say they were clean with a straight face. Another what-if type career. What if World War II didn't force a seven-year break from cycling (when Coppi became a prisoner of war in North Africa)? What if Coppi had competed just once in the Vuelta? If so, many argue he would skyrocket to number one on this list. But, that didn't happen. And woulda-coulda-shoulda isn't enough to put you over the top. Regardless, Coppi, a continuous thorn in the side of cycling great Bartali, took home two Tour de France GC titles—despite only competing in the event three times—and five Giro GC wins. Coppi also succeeded in the Classics, with a total of 28 one-day road race victories. If we give him those lost seven years, it's impossible not to surmise that Coppi would have earned substantially more Grand Tour victories. Perhaps we can summarize Coppi's career as follows: "Merckx was undoubtedly the greatest, but Coppi was the strongest." The Badger. Perhaps more well known stateside as Greg LeMond's chief rival and target of LeMond's persistent complaining. But this distracts from the true story: Hinault was an absolute wrecking ball on—and sometimes off—the bike. No one would dare insult or mess with a man whose apt nickname made him one of the most vicious and feared figures in all of cycling. His short temper and bossy nature led him to five Tour de France GC wins, three Giro titles and two Vuelta victories. Oh, and he only competed in a total of five Grand Tours outside the Tour de France, batting a perfect 1.000 at the Vuelta and Giro. Easily the most dominant cycling figure during the 1980s, we still feel Hinault 's impact across the cycling world. Our apologies to Hinault, but this was a relatively easy choice. Merckx, nicknamed the Cannibal for the way he devoured his rivals, was the closest thing we'll come to perfection in cycling. Owner of five Tour de France GC victories, five Giro victories and two Vuelta victories, Merckx's 11 Grand Tour wins places him one ahead of Hinault for most all time. In the 1969 edition of the Tour, Merckx went all Secretariat, winning by more than 18 minutes while capturing the yellow, green and polka dot jerseys. And, he'd be the first to tell you how difficult this feat was to accomplish. Merckx gave it his all, day in and day out, to the point where he routinely required oxygen at the end of stages. Merckx never entered a Grand Tour (17 in all) where he didn't finish in the top 10. Felice Gimondi – Winner of all three Grand Tours, including three Giro titles. Famously defeated Merckx at the 1973 Road Race Championship. Tony Rominger – Three-time Vuelta champion (claimed points and mountains title in 1993), Giro champion and two-time Giro Di Lombardia winner. Greg LeMond - Three-time Tour champion, two-time World Road Race Champion, Badger Slayer. Jan Ullrich – Perhaps the strongest man to ever grace the peloton. Claimed one Tour title and five runner-ups finishes. Laurent Fignon – Loser of the Tour by eight seconds to Greg LeMond. Also, twice winner of the Tour and original Badger Slayer.